I do like primary accounts of historic events and I decided to reopen this blog with a story about the Fetterman Fight, a famous victory of the Teton Sioux and their allies and equally infamous defeat suffered by the US Army elements, 2nd Cavalry and 18th Infantry, at the hands of the Lakota, Arapaho and Cheyenne warriors during the Powder River War. The fight took place 3 days before Christmas December 21, 1866, but since it is already late Fall this 2016 I decided to start today and finish the story on the day of the battle. This battle is famous for the deeds of the Oglala Lakota warrior Crazy Horse but also for the heroic death of Adolph Metzger(nice blog and a very detailed entry on our bugler) who was a veteran cavalryman and the bugler (the name means 'butcher' in German). When you read book you can learn about the soldiers who perished in this violent encounter. Let me start with this endorsement ..several years ago I read this book by the western Us history scholar Shannon Smith on this fight (Massacre)/Battle of the Hundred Slain (review here ). It is an eye opening book on many levels, and if you are interested in this battle, the Indian Wars, Army wives, or just the American history of the XIX century this book is definitely for you. Here, you can read prof. Smith's article on the new perspectives on the Fetterman Fight, sort of the book in a nutshell article. The battle was primary the Lakota Sioux battle, due to their numbers and importance, however I have always enjoyed the Cheyenne people and their stories, thus I am quoting here excerpts from their history book titled Fighting Cheyennes, and the accounts have the Cheyenne heroes of this battle too. I [Grinnell and George Bent] have talked of this fight with a number of the Cheyennes who took part in it, and from several of these have had the detailed story. One of them — White Elk — accompanied me over the battle-ground and pointed out the route of the troops, the hiding-places of the Indians, and the spots where different groups of the soldiers fell. It was at the beginning of cold weather. The Cheyennes were camped on Muddy Creek, and Crazy Mule was exhibiting to them his power. Different people were shooting at him, but the bullets and the arrows did not enter his flesh. Soon after these ceremonies were over White Elk, Plenty Camps, and Rolling Bull began to talk together about making an excursion to war, and at last determined to go, and set out toward the mountains. 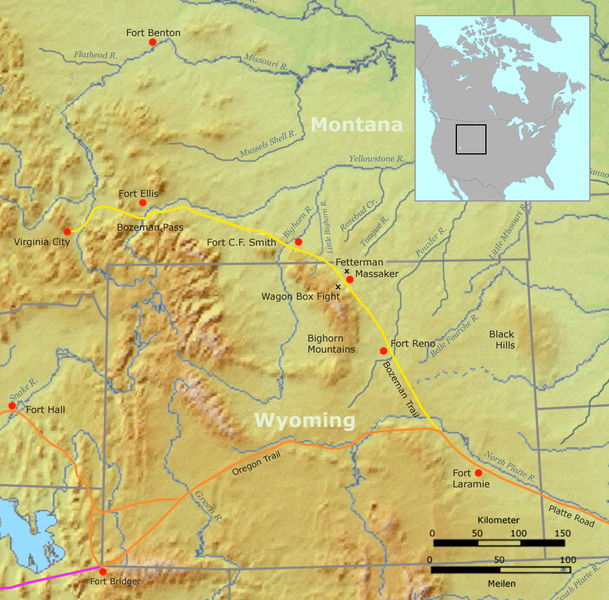 After leaving the camp they be^an to discuss the route they should follow to reach the country of the Shoshoni. They determined to go in below Fort Phil Kearny to the head of Powder River. As they were marching along. Just getting out of Tongue River Canyon, they met four Cheyennes returning to the camp, who asked: "Where are you going?" 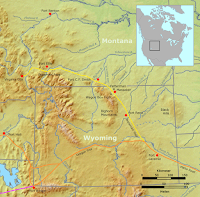 The young men said they were going to war against the Shoshoni. The four men warned them, saying: "Be careful how you go about the fort. Up to this time we have always been friendly with those people, but now they have been shooting at us. They are on the watch; so be careful" The three kept on their way and stopped at Big Springs on Tongue River. After they had reached camp. Rolling Bull asked: "What do you think of this that has been said to us? Shall we go back?" Plenty Camps said: "Let us go on a little farther and see what will happen." Both these men were older than White Elk. The message given by the four Cheyennes, of course, threatened some danger. From the post, and besides this to be warned in this way just as they were starting out on a journey was a bad omen. Plenty Camps, who seemed to be thinking, at length spoke, saying: "I believe that those four men we passed must have done some mischief up there by the fort. Let us stay here overnight and to-morrow return to the camp." At Fort Phil Kearny something like this had perhaps happened : The Sioux had been attacking the wood-trains and already had killed some people. They had thus shown their hostility. The four Cheyennes may have ventured near the fort, been recognized as Indians, and so have been fired on by the troops. To these soldiers an Indian was an Indian and so an enemy. Next morning the three young men remained in this camp till late in the day, when Plenty Camps said: "We will not go in to-night; let us sleep here again." Next morning early Rolling Bull said to White Elk: "Friend, get up and go down to the river and get some water." White Elk got the water, and had come half-way back to the camp when he thought he heard some one utter a yelp, and stopped to listen. As he listened closely he heard far off a number of people singing. He carried his water to their shelter and said to the others: "I think I heard a number of people singing." As they stood there listening on a sudden four Sioux rode in sight. They rode up to the camp and spoke to Rolling Bull, who could talk their language. He turned and said to his companions: "These men tell me that many people are coming, some on foot and some on horseback. Women are coming with the men. They are coming up Tongue River on their way to the Cheyenne camp." The Sioux told them that this was a war party brought together for the sole purpose of fighting the soldiers who were at Fort Phil Kearny. The Indians had laid a plan to try to get the soldiers into the open. They intended to send a small party to make an attack on the post to see if they could not induce the soldiers to come out from the fort " If we cannot get the soldiers to come out as we want them to," they said, "then we will attack the post." The four Sioux stayed there talking with the Cheyennes, and presently the whole Sioux party came in sight. 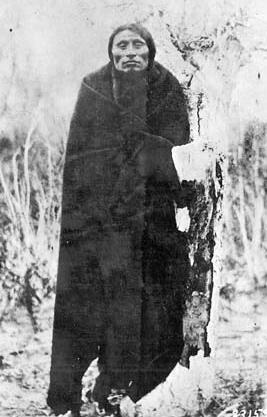 Some of the older Sioux shook hands with the Cheyennes and asked them to return with the Sioux to the Cheyenne camp. The Cheyennes went with them and that night they camped at the Big Springs near the head of the canyon. At dark an old crier went about the circle of the camp and called to all the companies of soldiers to get together, for a council was to be held. The Sioux men formed in a big circle about the camp and the chiefs and the soldier chiefs gathered in the centre, where the Cheyennes too were taken. There was much talking, all of it in Sioux and so comprehended only by Rolling Bull. After they had finished talking the Sioux came over to the Cheyennes and said to them: "Now to-night we have made our plans as to what we shall do, and we intend to ask the Cheyennes to join us. We have chosen four men to go on ahead and notify the Cheyenne and Arapaho camp of our plans." These two camps were close together. The four men selected had got their horses and saddled them and now rode up, and the Sioux chief spoke to than and at length they rode off. The next day near sundown the four Sioux messengers returned to the war party and told the chiefs that they had reported to the Cheyennes just what the chiefs had ordered, but that the Cheyennes had said that they must have time to get ready. Nevertheless, the Cheyennes must have left their camp in the night and come part way toward the Sioux camp, for the next morning — not very early — the Cheyennes and Arapahoes charged the Sioux camp — a friendly act. Then, after the charge, the Cheyenne chiefs gathered by themselves and told their young men that the Sioux had sent for them to help fight the soldiers. They must not weaken, but every man must stand his ground and do his best. After that all the Cheyennes fell in single file and rode all around the Sioux camp and stopped on the river below the camp and dismounted. They remained there all night. Next morning they went as far as Crow Standing Off Creek — Prairie Dog Creek — and camped. After leaving this camp they went up Crow Standing Off Creek beyond where it forks, keeping up the right-hand fork. Soon they came to a flat prairie and the Sioux were directed to form a line with a wide front — abreast. There were many of them. A Cheyenne chief called out to his people, saying: "Men, do not fall in line with the Sioux. We are not carrying on this war party." The Arapahoes did not form abreast like the Sioux, but stood to one side. Soon a person, half man and half woman — He e man eh — with a black cloth over his head, riding a sorrel horse, pushed out from among the Sioux and passed over a hill, zigzagging one way and another as he went. He had a whistle, and as he rode off he kept sounding it. While he was riding over the hill some of the Cheyennes were told by the Sioux that he was looking for the enemy — soldiers. Presently be rode back, and came to where the chiefs were gathered and said; "I have ten men, five in each hand; do you want them?" The Sioux chiefs said to him: "No, we do not wish them. Look at all these people here. Do you think ten men are enough to go around" The He e man eh " turned his horse and rode away again, riding in the same way as before. Soon he came back, riding a little faster than before and swaying from one side to the other on his horse. Now he said: "I have ten men in each hand, twenty in all. Do you wish them?" The same man replied: saying, "No, I do not wish them; here are too many people here and too few enemies." Without a word the half-man-half-woman turned his horse and rode off. The third time he returned he said: "I have twenty in one hand and thirty in the other. He thirty are in the hand on the side toward which I am leaning." "No," said the Sioux, "there are too many people here. It is not worth while to go on for so small a number." The He e man eh rode away. On the fourth return he rode up fast and as his horse stopped he fell off and both hands struck the ground. "Answer me quickly," he said, "I have a hundred or more," and when the Sioux and Cheyennes heard this they all yelled. This was what they wanted. While he was on the ground some men struck the ground near his hands, counting the coup. Then they all went back and camped on Tongue River, at the mouth of the little creek they were going to follow up. That night the names of ten young men were called out, and those called were ordered to start that night and to be ready the next morning to attack the post. There were two Cheyennes, two Arapahoes, and two from each of the three tribes of Sioux who were present. The two Cheyennes were Little Wolf and Wolf Left Hand. After he had been chosen Little Wolf rode over to the fire at which his brother. Big Nose, was sitting. A few days before the two brothers had quarreled with one another, Little Wolf said to his brother: "Brother, I have been called to go and attack the post; take my horse and do you go." Big Nose was still angry and said: "Take back your horse; I do not want him." Bull Hump, who wished to make the brothers friends again, said to Big Nose: "My friend, here are my moccasins and my war clothes. If you have any bad feeling you may have those clothes to lie in" (i. e., to be killed in). Big Nose accepted the clothes and agreed to go. Little Wolf and his brother Big Nose were both good men in a fight — one as good as the other. Some time after the young men sent to the fort had gone — just as day was about to break — all the men were called and ordered to saddle their horses, and when this had been done they moved out. They followed the stream up to the forks and there stopped. The Cheyennes kept by themselves and did not mingle with the Sioux. At the forks they stopped and a Sioux cried out, haranguing the Cheyennes, and asking them to choose which side of the ridge they wished to be on, the upper or the lower side. The Indiana hoped to draw the soldiers down this ridge between their two forces hidden on other side. One of the Cheyenne chiefs said that bis people would take the upper side of the ridge, and presently the order was cried out for the Cheyennes and Arapahoes to take the upper — west —side. In going up to the place selected, the people who were on foot stopped near the lower end of the ridge, not far from the stream, while those on horseback, who had the longest distance to go, went on up above. All the Cheyennes and Arapahoes were mounted. Some Sioux women who were along stayed below with the Sioux men who were on foot. After the different parties had gone to their places and hidden themselves everyone kept very still. All were waiting, listening for what might be heard. 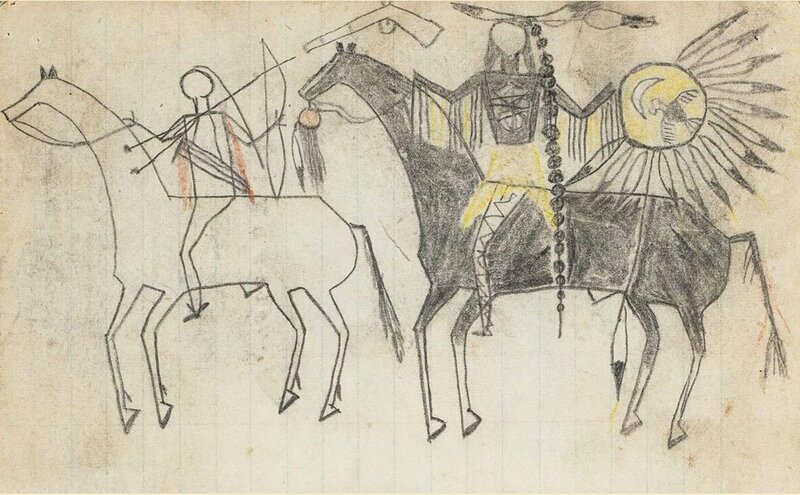 I could not resist to include this interesting and unusual ledger drawing* of the Cheyenne warriors fighting the Mexican lancers.